As recently as 2011, the idea of a device that was a usable mobile phone, yet also provided all the functionality of a tablet, seemed thoroughly fanciful. But then Samsung unleashed its GALAXY Note on an unsuspecting world, thereby proving that the very best of both devices could be combined in a single package. And now, the GALAXY Note 3 has arrived, taking the same concept of fusing the best aspects of phones and tablets but moving it up to an altogether higher plane. Here, then, are 10 reasons why you would be doing yourself a favour by upgrading to a Samsung GALAXY Note 3. Given that the Samsung GALAXY Note 3 functions as a full, multi-tasking Android tablet, the quality and size of its screen is of paramount importance. And the GALAXY Note 3 delivers in spades: its 5.7-inch Full HD Super AMOLED screen is impressively bigger than that of its predecessors. Plus, it's the highest-quality screen ever fitted to a GALAXY Note device, using the unsurpassed Super AMOLED technology, and can run Full HD for startlingly crisp and clear video playback. You'll also see a notable jump in clarity when using the GALAXY Note 3 for reading text, generating artworks and editing photos. While the GALAXY Note 3 preserves its predecessors' general outward appearance, it does so with an extra dash of classiness and tactile quality. One of the first things you notice when you get your hands on a Note 3 for the first time is the soft-touch, textured back cover, with its delicate stitching. There's a slight serration on the side, which puts you in mind of physical notebooks – deliberately, since one of the GALAXY Note 3's many abilities is to operate beautifully as a notebook with which to document your life. There are also new colour options – Jet Black, Classic White and Blush Pink, to be precise – and there will be loads of interchangeable back covers available for it. The S Pen has also been uprated hugely for the new model. For example, by clicking its button when you hover it over the screen, you can now launch the Note 3's Air Command, which gives you instant access to five key functions: Action Memo, Scrapbooker, Screen Write, S Finder and Pen Window. Those contain countless innovations, including the ability to open up new windows on screen by simply drawing boxes, or searching for something across all the types of content. Samsung has paid particular attention to the thorny – and topical – issue of security with the GALAXY Note 3, via a feature called Samsung KNOX. Samsung KNOX is based upon an intriguing idea: it allows you to run and store security-sensitive apps and data inside a protected environment called Container. Container works by providing protection against malware and phishing attacks at a system level – you can think of it as an extra-fortified space within your GALAXY Note 3, into which you can place, for example, your most precious photos or videos. And Samsung KNOX can even be hooked up to secure office systems, which is a boon for those who regularly work remotely. 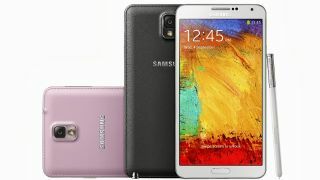 One of the biggest features which elevates the GALAXY Note 3 above mere mobile phones is the ability to multi-task – a function made practical, of course, by the extra screen real estate. So it should come as no surprise to learn that Samsung has improved the GALAXY Note 3's multi-tasking abilities. Multi Window lets you toggle between apps without closing windows or having to open new pages. Now you can also use two of the same apps at the same time, so you might want to have two chats on the go, with two ChatON windows open simultaneously, or have two Internet windows open allowing you to view two seperate websites on the one screen.